What was a quick but planned road trip with my wife and friends, turned out to be a fun little inclusion of this out of town comic book convention appearing four of the great artists who've helped me on this campaign. 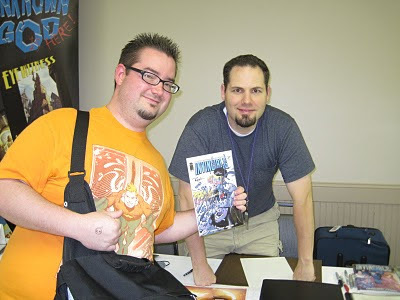 There was NO way I was going to miss stopping and meeting Ryan Ottley, Jason Howard, Jamal Igle and Jeremy Haun... although I've already meet Mr. Haun. But I still had to thank them all personally and get photo's/autographs and shake their hands. Now, I didn't know what to expect from this convention. My local con in Kansas City Planet Comicon is pretty busy and there can be a few lines. And granted, this was the second day of the convention, but rooms these creator's where in just seemed small. And there was hardly any waiting. This was a great opportunity to just chat with the creators. 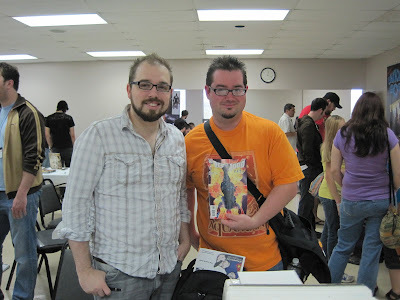 The first table I hit up was the duo of Ryan Ottley and Jason Howard. 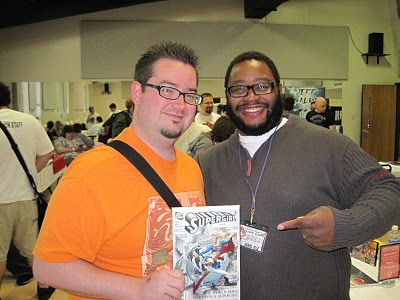 Artists of Invincible and Astounding Wolf-man, respectively. These two guys are super nice. Right away Ryan mentioned, "You look familiar." It's kinda cool, even when Ryan had only briefly meet me once in San Diego in 2006. Right around the corner was familiar face Jeremy Haun. Previously when he first mentioned he'd "draw me in", he had mentioned a totally different project he's working on through Wildstorm. I had thought appearing in Red Hood was it for an appearance but Jeremy had said his previous mention still stands. Can't wait to hear about this new project! I had to hunt down Jamal Igle. Again, they had all the creator's kind of separated into different rooms I got worried and had to ask where he was sitting. But it was great to meet him and shake his hand and thank him for such a great panel. I seriously love that page! What seems weird is the main focus was meeting all these artists who had already helped me out. It was unfortunate that Patrick Gleason had to cancel because I have had enjoyed his work on Aquaman and Green Lantern Corps. Some other convention perhaps. 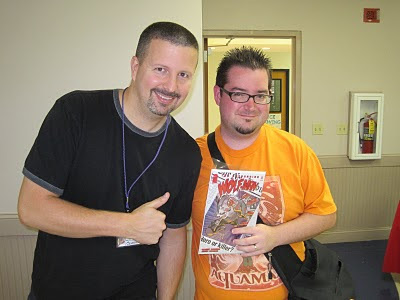 I had ran into Phil Hester and Ande Parks and gave them both a flyer... again. It's almost a running joke, every year a new flyer. 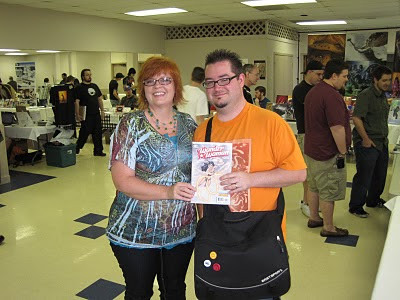 On the last leg of this show I came across Ethan Van Sciver and Gail Simone. Ethan I had managed to send a message to about two years ago on MySpace and was less than receptive of my cause. Guess I shouldn't have been too surprised to see his stance hadn't changed over time. Gail however was awesome to chat with. I enjoy talking shop with everybody. It's weird as a fan to have invested time and money in this hobby, just in the back of your head keeping these other worlds and fictional characters alive, and then to chat with somebody who plays in the sandbox of these universes... and really just... cares about them. So Gail if you're reading this, thanks for the chat. Love your stuff. Again, I know you don't draw'em... but would love to be in one of your books someday. As far as artists and writers go, this show hit the jackpot. I did a round flipping through dollar bins and didn't really spend a whole lot. But I was in and out in two hours. That just blows my mind there. But really since this was a side trip on the vacation I was already on, I just just glad to get my time in. Thank you St. Louis, for putting together a great guest list. Thanks to everybody I shook hands with, it was great meeting you!